Playing in front of a massive crowd , the kind that has not been seen in a local football match in decades, Gor Mahia were held 0-0 by English side Hull City who then went on to win 4-3 on spot kicks. NAIROBI, Kenya, May 13- Despite goalkeeper Boniface Oluoch saving three penalties, record Kenyan Premier League champions Gor Mahia lost to English Championship side Hull City 4-3 on post match penalties in an international friendly match played infront of a sold out 60,000-seater Moi International Sports Centre Kasarani on Sunday. Gor Mahia put up a brilliant display and the crowd roared in appreciation after the penalty shoot-out following a barren draw in regulation time. The home side had the advantage heading into the final kick of the first five and it only needed Cercidy Okeyo to score, but he saw his kick saved and in turn Hull came alive in sudden death. The two teams scored their first kicks. However, Kevin Omondi saw his penalty saved with Hull scoring the response, ending up 4-3 winners. It was once again a tale of missed chances from the Kenyan champions who created chance after chance especially in the first half, but could not burry any of them. However, Dylan Kerr’s charges will leave chests high especially after performing in an exemplary fashion against a side that plays in the English second tier league and one that has history of playing in the Premier League. Kerr will pick positives and inspiration from this game as he prepares his side for their second CAF Confederation Cup Group D match against Algerian outfit USM Alger at the same venue on Wednesday night. The atmosphere was terrific with the K’Ogalo faithful roaring their team on against the Championship side while the neutrals cheered and raved on from any beautiful move from either side. Kerr started off a strong side with the only difference from the team that played Rayon Sport last weekend in the CAF Confederation Cup being Ephraim Guikan starting upfront alongside Jacques Tuyisenge ahead of Meddie Kagere. The home side had a half chance four minutes in, George ‘Blackberry’ Odhiambo trying his luck with a left foot snap shot from distance, but it went straight to keeper Marshall. Three minutes on the opposite end, Hull had a chance when a cross-ball bounced inside the box from the right falling on Frazer Campbell’s feet, but the former Tottenham Hotspur man’s effort to dribble his way into the box was stopped by a forest of legs. A sweeping team move from Gor Mahia, cheered on and appreciated by the partisan crowd handed them a decent scoring opportunity. Odhiambo swept the ball low into the edge of the box from the left into Guikan’s path, but the Ivorian’s shot was well handled by Marshall. On the other end in the 12th minute, Evandro’s freekick from the right found Jon Toral unmarked at the backpost but the lanky winger’s header at goal flew over the post with keeper Oluoch beaten. But it was the home side which enjoyed most of the scoring chances, creating with style and grit. In the 19th minute, Francis Kahata should have opened the scoring on the counter when he was picked out by a well weighted pass from Odhiambo unmarked on the right, but the midfielder’s shot at goal after driving in ended wide. Kahata came close again in the 27th minute with a freekick from the edge of the box after Tuyisenge was brought down, but his curling effort over the wall was inches close, rolling over the bar. Three minutes later from another counter Humphrey Mieno released Tuyisenge through on goal, but the Rwandese could not hit the ball on target, curling it beyond Marshall but inches wide of the target. Three minutes to the break, Gor had another chance again when Odhiambo’s corner found Ernest Wendo at the edge of the six yard box, but the Gor battering bull missed a chance of a rare goal for the record Kenyan champions failing to put in a strong header past Marshall. Good game from the men in green. The only observation is the finishing. we need to take chances that the midfield does well to create. If that is kasarani, then what more can we ask for apart from proper maintenance???!!! This is one of the real football powerhouses in the world.Drawing nil nil against English championship side is not a walk in the park.In a nutshell, Gor won.USM Alger beware this team is strong. Very good game from our boys.. actually we would have won it comfortably in the 90 minutes.Both teams were extremely poor in penalties. However,we need to be sharper infront of goal otherwise it will prove costly at the end. As for the likes of Kevin Omondi,alot of improvement is required!! Kevin Omondi was my man of the match!!! Hope you are trying to be sarcastic. Congratulations to all for the good game and good stadium. Take advantage of transfer window and beef up. You still have many more games ahead. You have sportspesa cup bring 4 Tanzanian teams against Kenyan 4, Kagame cup is back, and so on. GM leads and others follow. Shame ! Wich kuot drawing a second division side from another country…we should have won convincingly in open play . I also cast huge doubt on Kevin Ade omondi and cercidy okeyo….this players have serious weakness and I think we should look elsewhere for the likes of Duncan otieno , shami kibwana , amos nondi and Eric Marcelo ouma for reinforcement in june transfer period. That Was An Exemplary Display By Mahia. Whether We Scored Or Not Is Nrither Nor Their. Bring On Warabu Anytime We Will Teach Them A Thing Or Two About Soccer. Amooor! Remember Everton and Hull City are coming back for the Sportspesa challenge in June and it will be held in Kenya. The game was good and i enjoyed it…..Kogalo is on his own class . welldone boys. Jasego, there are definitely still “passengers” at K’Ogalo best example is no.14. Selfishness by our forwards cost us the game within 90mins, e.g Kahata & Jausenge choose not to pass to a better placed teammate but rather go for individual glory (and possible signing by Hull City) and still missed. Great show piece though, now for serious football versus USM Algiers. Could SPesa consider sponsoring CECAFA instead letting that great regional tournament die. What’s the point of having a SPesa Cup and CECAFA, the football calendar will be too crowded. Our defence was superb today. Our midfield was outstanding. We had one role upfront and the role was to ‘score goals’. Our strikers let us down. Tuyisenge shooting wide instead of passing to another striker in front of a poorly guarded Hull defence. Hull City paraded their fringe players and retreated when they couldn’t match the physicality and weather of the game. Wasting chances then smiling counts for nothing. Thanks for the fans who turned up to watch the match. I think anybody who have watched the FA cup or the lower league that Hull city plays in will appreciate that it is of a standard that is way above any competitive league in Africa , one of those lower tier leagues knocked Manchester city from a cup competition this season and hence exagerated emotions aside , there is absolutely nothing to feel ashamed about loosing to a team of that nature . Overally we played well til the last third of the pitch and this is something we have talked over n over on this wall , a fact acknowledged by the coach . My friend Kevin Ade has been having very underwhelming performance everytime I have seen him play this season . Mieno slows down our transition every time he has the ball giving opponents time to regroup and get back to shape . Guikan is instinctive and those are good qualities for a striker , all he needs is precision and composure. Jacques Tuisenge really needs to get his confidence back , his decision making of late have not been up to standards required at this level. Overally , despite the absence of goals , it was a very entertaining ground football , the type that is based on our carpet philosophy but this guy called Shakava I have noted always has this impulsive instinct of hitting the ball into the atmosphere , he needs to calm down and learn to play the ball from the back , it would be a bit appreciated if majority of those hits reached the recipient . Just watched repaeat and generally it was a good game but we should note that in the second half Hull players refused to run, but still we could not score, which is really worrying. Are is a very skilled and technical player but needs two things: physical fitness and regain his confidence, Gor supporters are very demanding and this can affect a player’s confidence and force erratic performance, he took a very good penalty that was unfortunately saved by the keeper but pessimists will only remember that he didn’t score. Looking forward to Wednesday, gava should declare a national holiday. Hahaha! A public holiday? JTG no need for holiday since the game will be played at 7 p.m.
A team comprising Francis Kahata, Innocent Wafula, Boniface Omondi, Lawrence Juma and Blackberry should have been fielded in the first half to kill the game. These are very swift and attack-minded players. It was evident that Hull started struggling in the 20th minute and with concerted attack would have conceded 3 or 4 goals in the first half. The slower paced midfielders should have come in the second half. It is such a pity that jersey number 10 which is supposed to be special in every team is not accorded that kind of value in Gor Mahia. J’Asego I concur with Oduor12 that we acquire one top class striker in addition to that midfielder from Ghana. We are good, mean defense but we need to work on our striking department. I know good strikers are hard to come by on these parts of the world, may be its time we think shopping in Europe. 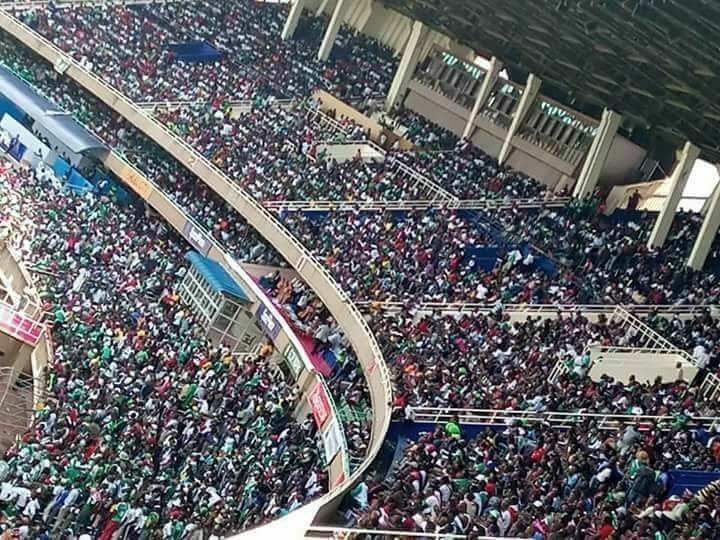 It is very sad that such a large crowd could still not spur K’Ogalo to a win. When will GMFC make home support count? @ODUOR 12 Just imagine that the Gate collection of 60000 turnout @ Ksh 100/= netted 6 million and yet clubs keeps milking GOR matches @ Ksh 300 for terraces. Lessons to learn. We are supposed to be ruthless and unforgiving at home just like Arab teams when playing in their backyard. Our tendency of being “nice” to visiting teams should stop. This then begs the question as to what happened to K14 upon returning? Is this not the same player who fired 4 goals into our goal in our friendly match Administration Police? Perhaps he no longer sees the need to work hard coz his ultimate objective to come back home is already achieved. Then Mieno? The player who would send shivers down our spine when he was in Brewkenge. Fitness? He is taking too long. Same case with Guikan. Is Sandro Fantoni still in charge of fitness? Finally, I feel we are wasting Philemon in the defence. Joachim Oluoch has played in that position very well. Why not deploy Joachim at 2 push Phillemon to the midfield? We should not continue experimenting… at least against the Arabs. I think bloggers and fans should stop castigating and blaming players for having not won the match against Hull City. We as Gor Mahia team has a huge task on Wednesday this week. I personally think the team played well and reserved energy for Wednesday game that we must win to enhance our chances of qualifying for quarter finals. It was a good showcase of talents in Gor Mahia team and I hope some of the players will be invited for trials and sign-ons by foreign teams. We are supposed to be ruthless and unforgiving at home just like Arab teams when playing in their backyard. Our tendency of being “nice” to visiting teams should stop. This then begs the question as to what happened to K14 upon returning. This is the same player who fired 4 goals into our goal in our friendly match against Administration Police. Perhaps he no longer sees the need to work hard coz his ultimate objective to come back home is already achieved. Then Mieno. The player who would send shivers down our spine when he was in Brewkenge. Perhaps another case of lack of fitness. He is taking too long. Same case with Guikan. Is Sandro Fantoni still in charge of fitness? Finally, I feel we are wasting Philemon in the defence. Joachim Oluoch has played in that position very well. I wonder why not deploy Joachim at 2 push Phillemon to the midfield. We should not continue experimenting… at least against the Arabs. What an atmosphere. That is what the Kenyan sports lovers are yawning for. Raise the standards of the game at club levels and people will come to watch. When clubs continue to display mediocrity no real competition will be realized. To me this was lesson for the local coaches. Please go back to the drawing board for the good of of the game. Something must be done with the coaches to raise the standards. If You can have ten Gors in the League, what can stop us from making an impact in Africa and in the World. The kind of Football that Gor displayed was superb. We keep saying that they are in a class of their own in the country. Good football knows no bounds. Look at the crowd and notice the mix. People do not care where one comes from all they want to see is good soccer. We came watched and enjoyed. With that kind of a crowd which sponsor would hesitate to ? They will come rushing like wind. Gor you have made Kenyans proud. That is just my thinking. @OT I’ve also advocated for the magical kes.100bob for GM’s terrace ticket price plus e-ticketing but EC appears ever hesitant, even the USM Algiers match has gone back to 200bob. Now, according to Bolo the match raised kes. 3.6 million which translates to 36,000 fans if all paid kes.100 for the terraces or even much less fans if you factor in the VIP fans. Yawa, Sally tupatie breakdown before we draw conclusions, ama hii kazi ya hesabu inakulemea! Oduor12 and The Trailer I am sure you can how this issue of ticket prices was hotly debated in this platform some 7 years ago. Then it was argued that the gate charges should be high in order to lock out members of the Human Waste branch and motivate only cultured, and decent supporters to attend with their families. Omera kara we have a human waste branch in kogalo?Magi weche mapek nade nii yawa? I really hate it when we the fans perform our solemn duty , fill the stadium with the hope of advancing our club then some official comes along to declare figures that just do not make sense , reminds of a case last season when there was a similar crowd involving Muhoroni youth in the same stadium , home and away ( moi stadium ) and while our home game realised 600k , muhoroni’s raised close to 3m . Now this is the problem in Gor and this where our focus should be instead of headlessly looking outside as to whom to blame with questions like where was he or she when we needed him most . I want to declare here and now , without any fear of contradiction that Gor Mahia without any handout from anybody was going to fly to South Africa , the crisis was engineered to create an embarassing and pathetic situation for a hand out to occur from Gullible politicians . It is these kind of nonsense that puts off wellwishers bcoz who in the right mind put his /her money into this bottomless pit controlled by scavengers . Than 7m , how pray does Simba vs Yanga derbies realise 21m . . . .
After such brand repositioning gathered through sportspesa during #hull city in kenya; surely why should the scribes and social media site concentrate on highlighting K’Ogalo with a bank robber that has little to do with the club. Why is our own media busy with a negative publicity simply because the suspect donned a GM jersey. KWELI THIS KENYA.. WACHENI CHUKI ZA OVYO. Just sample the local news highlighting “GOR MAHIA” as regards US Montgomery County Police Department report on robbery. Yes! the blame culture and looking for scapegoats in the name of Kogallo. Did sportpesa not do their homework on the stadium ? True, a significant section of the stadium has been severely looted and in some areas seats are practically missing. The washrooms are a mess, clogged up with “God knows what ” and stinkingly filthy and could take a month to clean up. its now a health and safety issue. I wonder how everybody did not see this coming ……………………… But nevertheless , a high level kogallo team has been dispatched to the ministry to appeal the temporary stadium ban and hopefully it shall be overtuned just before the wednesdaymatch. do the officials have a choice now that the algerians are here ? Charge Them 100 Bob N The Hoolifans Are Back In Full Swing. Indeed Gor Has A Human Waste Branch! !